Children's Play Cookware Set Only $6.78 + FREE Shipping! You are here: Home / Great Deals / Amazon Deals / Children’s Play Cookware Set Only $6.78 + FREE Shipping! 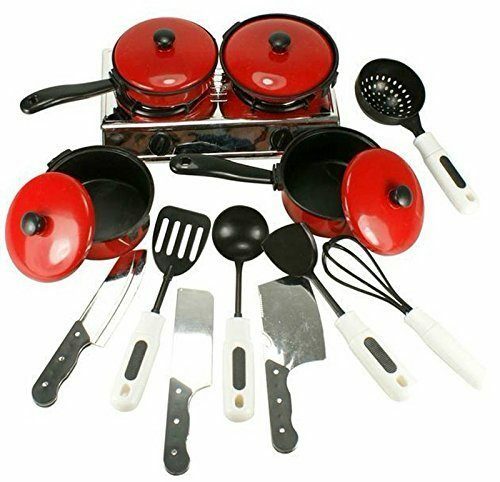 Children’s Play Cookware Set Only $6.78 + FREE Shipping! Have you been looking for a play cooking set for your children but don’t have a play kitchen? I have just the thing for you! Right now, you can get this Children’s Play Cookware Set for just $6.78 with FREE shipping! This comes with a 2-burner play stove that your kids can use to “cook”! Already have a kitchen for your kids? This set would be a great addition to it! My daughter doesn’t have many pots and pans, so this is perfect for her! And, the 2-burner stove can be used so your kids can cook in other rooms in the house!